and the British Museum, taken during a multi-day photographic training session. This Overview has samples and Display Composites leading to the section pages. 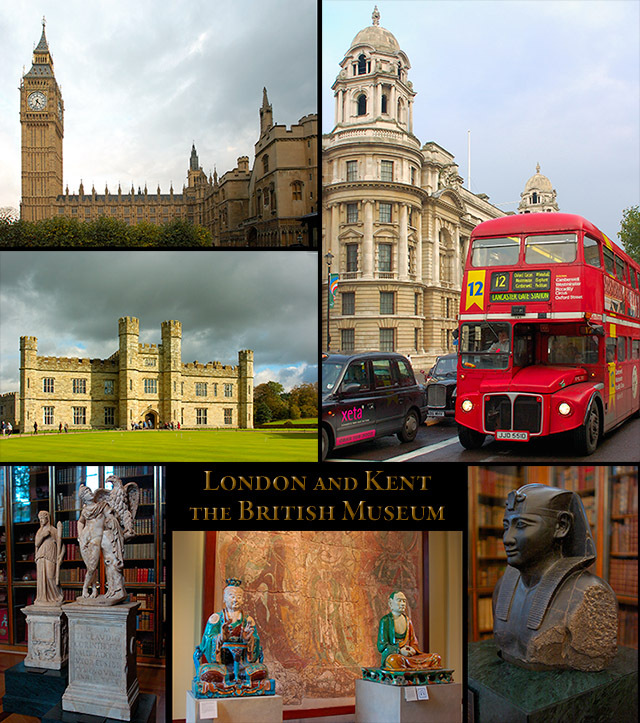 The Banner below leads to the London and Kent Collection where a Gallery can be selected. 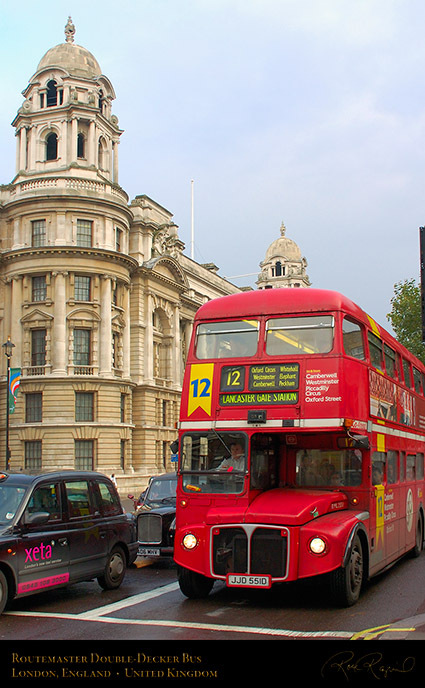 One of London’s most famous symbols, the Routemaster double-decker bus was made in the 1950s and 1960s and were in use until 2005. This is RML 2551, a lengthened bus on Route 12, retired into private ownership one month later. Elizabeth Clock Tower of Westminster Palace, known for its bell Big Ben, is vignetted by foliage near Westminster Bridge. 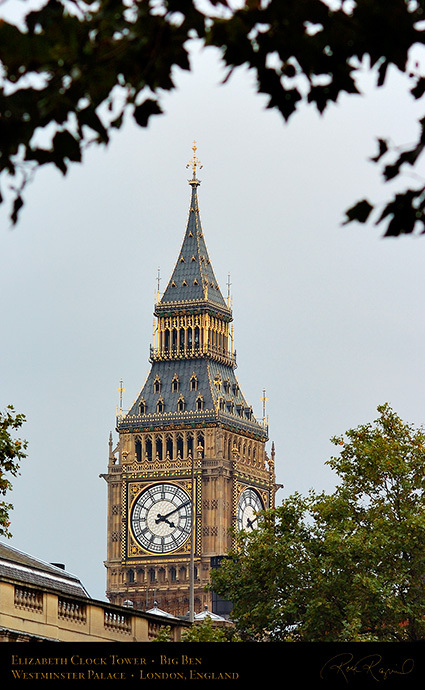 The tower holds the world’s largest four-face chiming clock and is the third tallest free-standing clock tower. 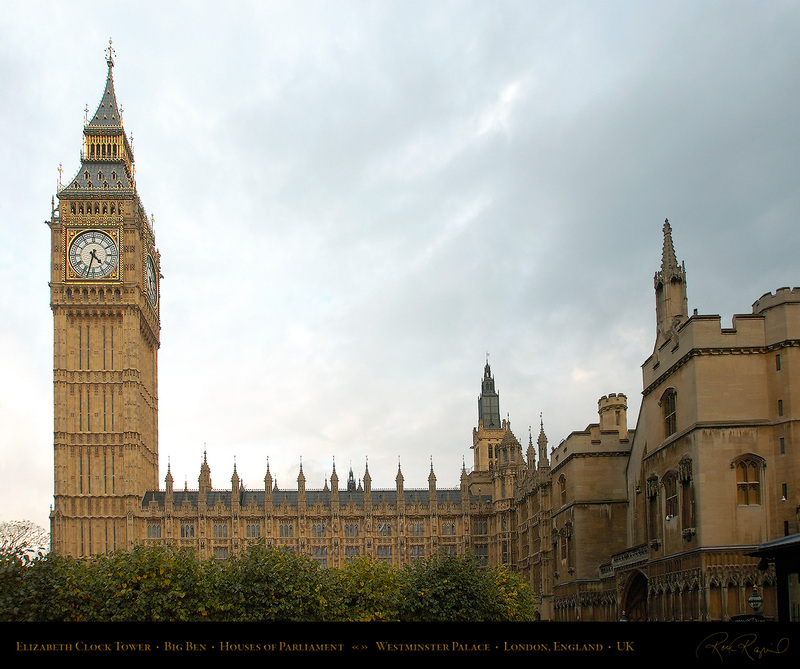 Westminster Palace contains the Houses of Parliament and stands on the bank of the River Thames. House of Commons, so the Old Palace was destroyed to avoid annoying the neighbors. Classic. of firefighters who wet down the 14th century hammerbeam roof. The Jewel Tower also survived. The New Palace was rebuilt in Perpendicular Gothic style by Sir Charles Barry, detailed by Pugin. 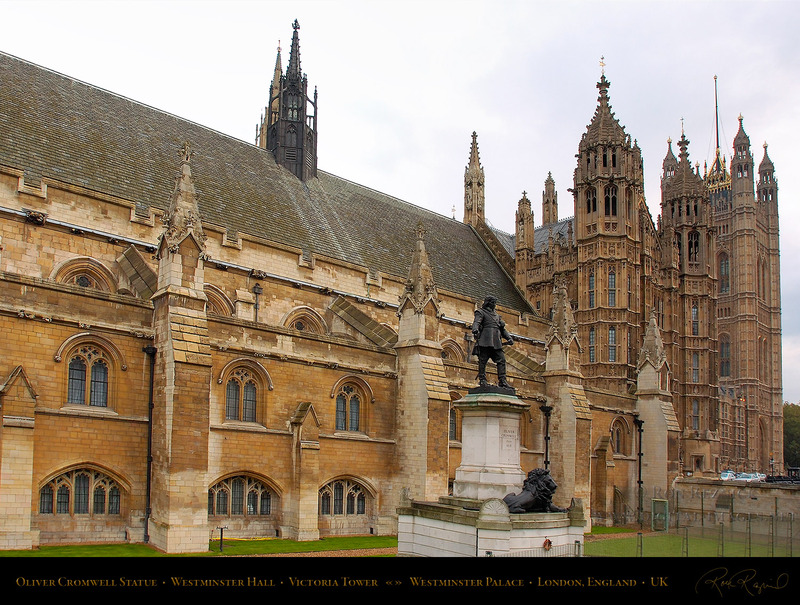 Westminster Hall, the only surviving part of the Old Palace, was originally erected in 1097. The outer walls still survive. At right center is the 1899 statue of Oliver Cromwell, by Hamo Thornycroft on Cromwell Green. This controversial statue of the Lord Protector of the Commonwealth was emplaced even though many Conservatives and Irish Nationalists voted against it due to Cromwell’s conquest of Ireland. The towers at right center stand over the St. Stephen’s Hall Entrance to Westminster Hall, at the far right is the Victoria Tower. This square tower at the southwest end of Westminster Palace was the tallest secular building in the world at 396 feet when the wrought iron flagstaff was erected in 1855. The Victoria Tower stands at the end of the House of Lords and was purpose built as a fireproof storage structure for books and documents. The records of the House of Lords survived the 1834 fire as they were stored across the street in the Jewel Tower, but the records of the House of Commons were destroyed. The main entrance at the base of the tower is the Sovereign’s Entrance, through which the Monarch passes when entering Parliament. The first 12 floors are Parliamentary document archives. Architectural and interior designs were by Augustus Pugin. 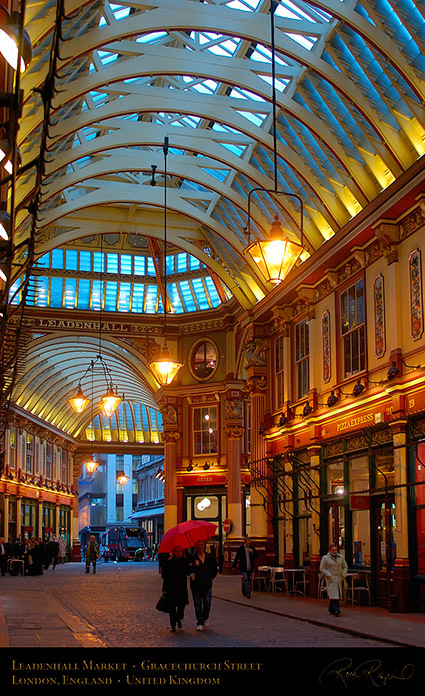 Leadenhall Market is a covered market on Gracechurch St., dating back to the 14th century in the historic center of Roman London. It was originally a meat, poultry and game market on the site of Leadenhall Manor in the early 1300s. Leadenhall was gifted to the city in 1411 and the manor hall was replaced with a public granary, school and chapel in 1440. 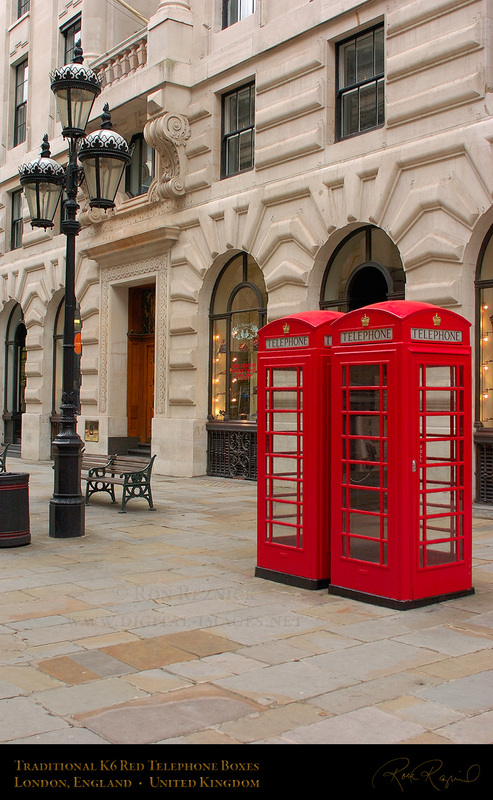 Traditional red K6 telephone boxes in a shopping area in central London. The iconic red kiosks are a symbol of Britain throughout the world. First produced in 1920, these are the K6 version designed in 1935 to commemorate the Silver Jubilee of King George V and the first to be used outside of London. 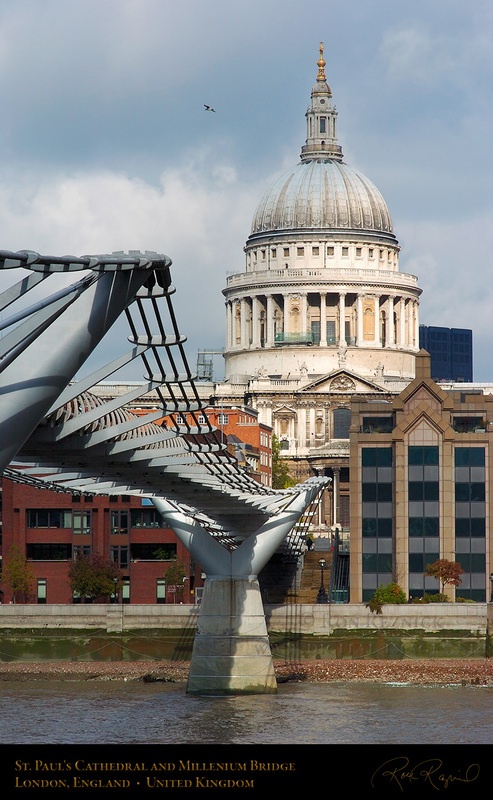 St. Paul’s Cathedral taken from the south bank of the Thames across the Millenium Bridge, a pedestrian bridge between the cathedral and the Globe Theater across the river. 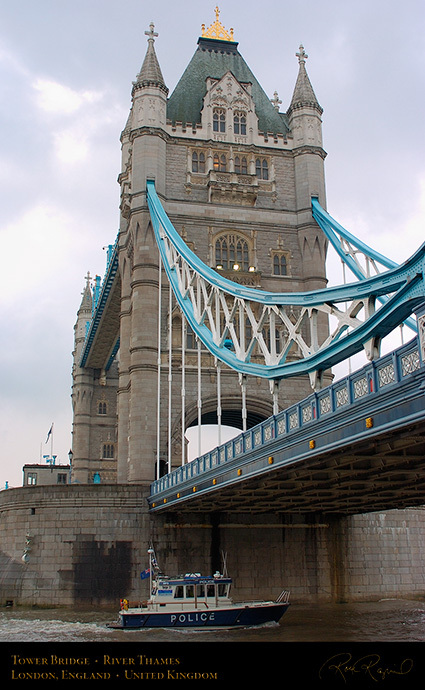 A Police boat travels under the suspended roadway on the south side of Tower Bridge, a bascule and suspension bridge over the River Thames near the Tower of London. Built between 1886-94, Tower Bridge is one of the world’s most recognizable bridges. the London Eye, and other sites in central London. One of the must-see sites, day or night. as Traitor’s Gate as it was the entrance used to bring the State’s prisoners into the Tower of London. Luxurious apartments were built on the upper floor, and arrowslits and a portcullis protected the dock. Blundeville Tower in medieval records after the Constable of the Tower. It is on the inner curtain wall. Henry VI was murdered in the small chapel off the presence chamber (Wars of the Roses, 1471). 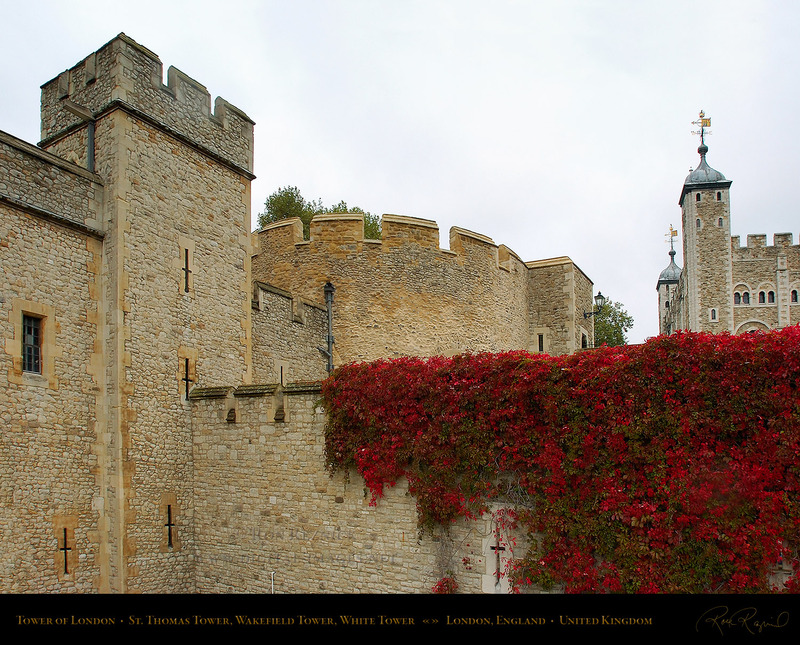 In 1869, the Crown Jewels were moved to Wakefield Tower and remained there until 1967.
the successor to William II, as a scapegoat for the creative financial extortions of the previous King. Ranulf Flambard was not only the first prisoner at the Tower... he was also the first to escape. 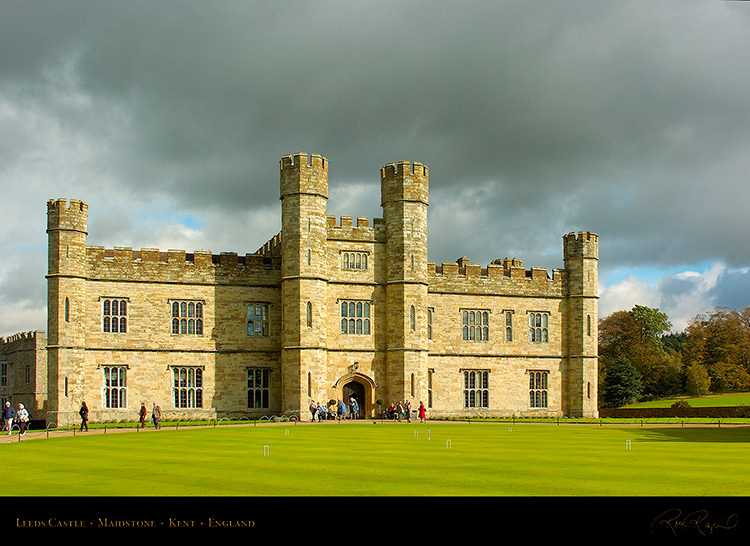 An oblique view of the Tudor facade of Leeds Castle in the afternoon sun. 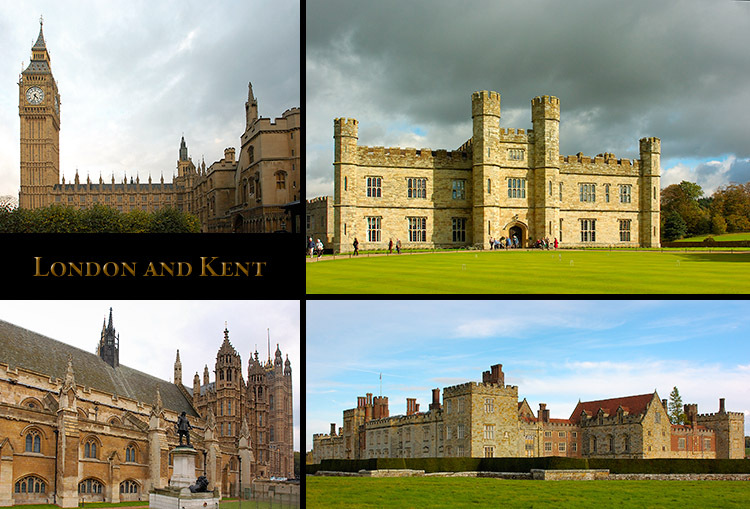 Leeds Castle is considered by many to be among England’s most beautiful castles. It has taken many forms over the centuries: originally a fortified Saxon Manor and Mill which was listed in the Domesday Book (which was a highly unpopular asset survey conducted in 1086 for William I, also known as William the Conqueror, to determine who held England’s wealth), it was rebuilt as a Norman stronghold (motte and bailey) in 1119, and was acquired as a royal residence by Queen Eleanor of Castile, wife of King Edward I in 1278. For the next 300 years it remained a royal residence until Henry VIII granted it to Sir Anthony St. Leger in 1552 for the annual rent of £10 as a reward for his services in subjugating the Irish Uprising. It was then handed down through a network of interlinked families for 400 years. In 1926 it was sold for death duties to Lady Baillie, an Anglo-American heiress. 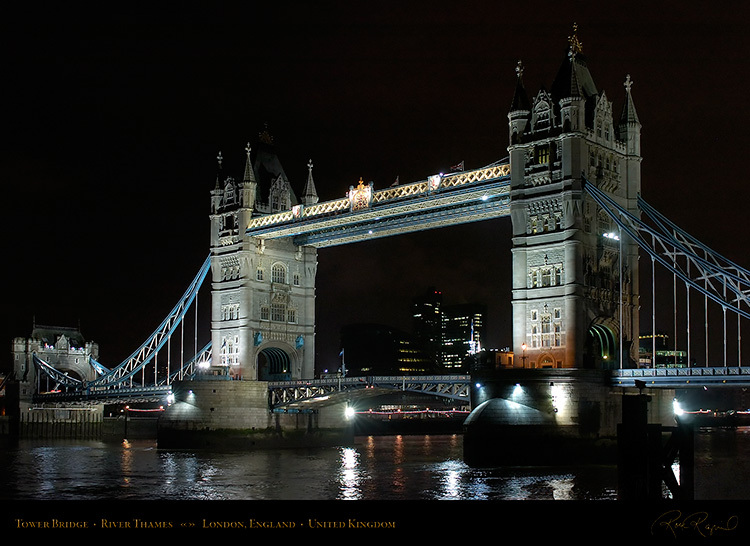 Click the Display Composite above to visit the London and Kent page. 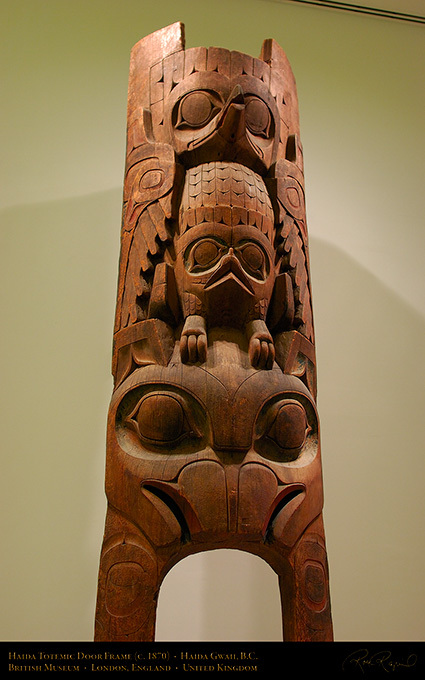 A Haida totemic cedar door frame, carved c. 1870, from Tanu village on Moresby Island, Haida Gwaii Archipelago in British Columbia. The split top held the ridge pole of the house. It has a spirit eagle on top of another unknown spirit animal. 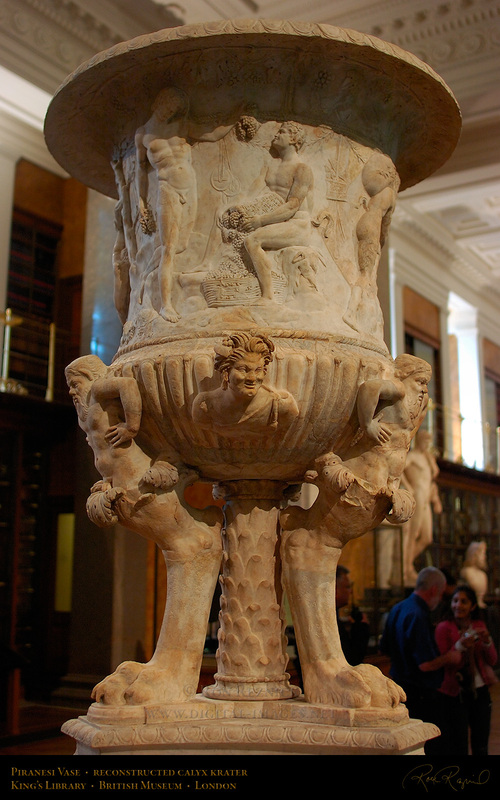 The Piranesi Vase (or Boyd Vase) is a marble crater on three legs and a triangular base with relief decorations of satyrs, by Giovanni Battista Piranesi in the 1770s. Piranesi created this vase using ancient fragments found at the Panatello, a site at Hadrian’s Villa at Tivoli near Rome in 1769. 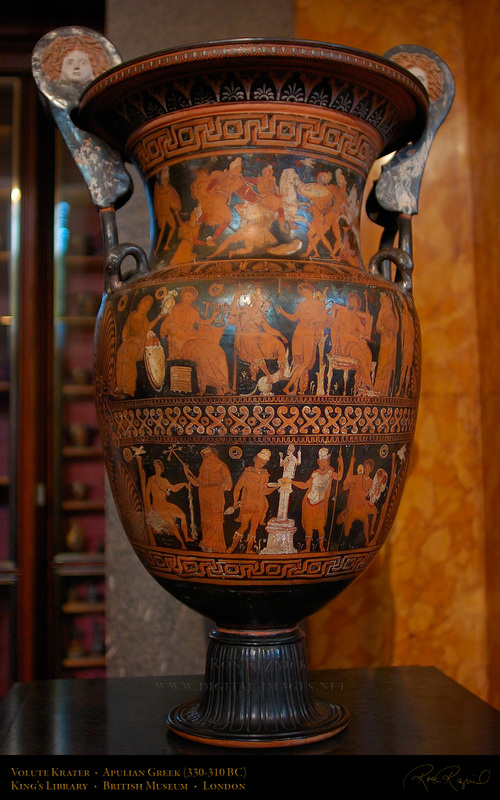 Colossal Volute Krater in the style of the Baltimore Painter, Apulian Greek, 330-310 BC. The handles have Gorgon heads on the upper termination, on the lower are swans heads. On the right handle is a painting of a winged female figure, facing the vase holding a plant. Around the lip is an egg-moulding design, and below the lip are black and white palmettes. Below the palmettes are meanders in perspective with palmettes on stalks in the squares. On the neck are scenes of Greek warriors engaged in close battle with Amazon warriors. On the shoulder below are palmettes and lotus flowers alternating, with egg-moulding below. figure of Artemis, wearing a Phrygian cap and a chiton reaching to her knees, holding a spear. At her feet is a hound, fawning on Ganymede, who is leaning on a stump with right hand extended. Next is Zeus seated on a throne looking at Ganymede, holding a scepter with a four pointed star. Right of Zeus is Hera, standing with bracelets, a necklace and crown, holding a lotus scepter. On the extreme right of the upper body is Hermes, standing, with caduceus in his right hand. This group of Greek deities is most likely watching the scene which is playing out below. On the lower body, from left: Sacrifice by two heroes (probably Oinomaos and Pelops). with sword slung, a club in hand, looking at a tree stump with a displaying dove on top. To his right is a crowned female deity, perhaps Aphrodite, holding a four-armed torch. a chlamys fastened with fistula, holding a slender water pitcher and an offering bowl. cuirass, with a spear in his left hand and a phiale (slender water pitcher) in his right. with a dove about to land on the stump. Meanders repeat on the base of the krater. This is an absolutely superbly detailed ancient Greek volute krater. 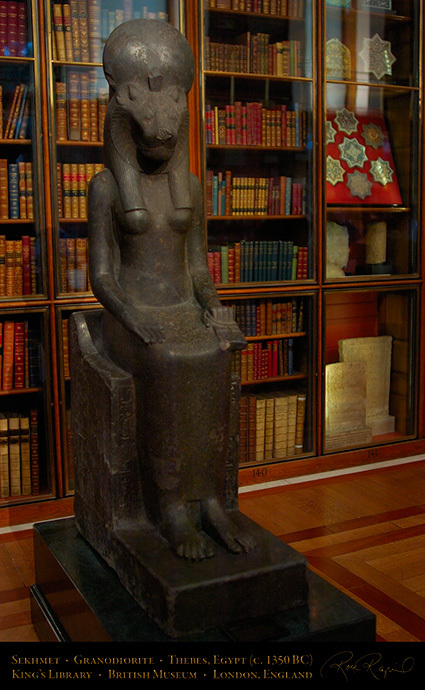 An 18th Dynasty seated statue of Sekhmet, wearing a deep wig, collar, bracelets and anklets (c. 1350 BC, Thebes). The statue is made of Granodiorite and is 7.75 feet tall. The 22nd Dynasty inscriptions give the name of Sheshonq I.
Roman 2nd century marble statue of Ganymede wearing a Phrygian cap and chalmys, leaning against a tree stump and looking at the Eagle of Zeus. 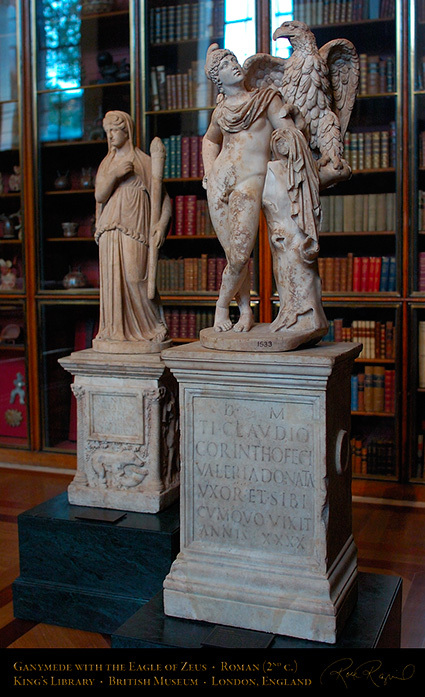 The 88 cm statue stands on a 1st century Roman funerary altar. incised around the neck, and a winged scarab is incised in the chest below the sun-disc. There is also a raised scarab beetle (associated with the god Kephri) on the forehead. and probably put on a thick layer of green paint to help disguise the repairs. 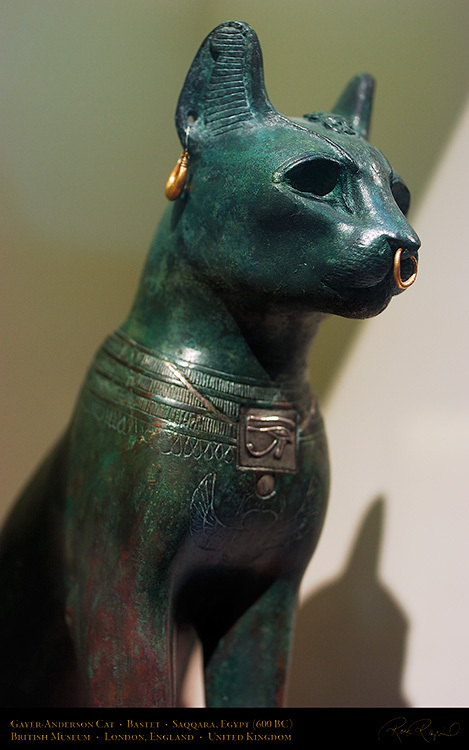 The Gayer-Anderson Cat is one of the best known of all Egyptian bronzes. 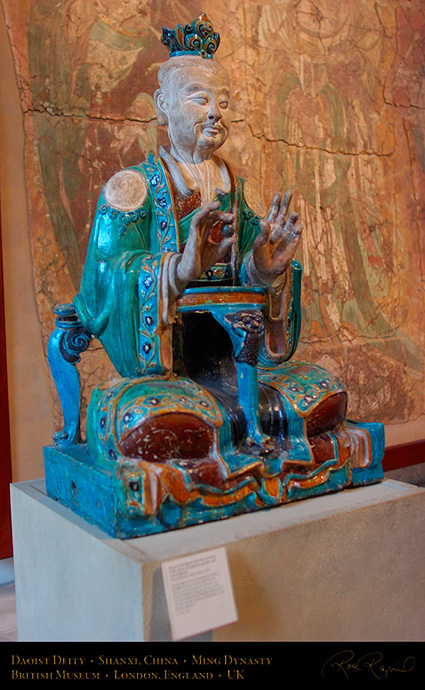 The seated figure of a Daoist deity holding a black pearl in his right hand, Ming Dynasty (1488-1644), of polychrome glazed porcelain from Shanxi Province, China. He is depicted as an old man with a long beard, his hair is scraped into a bun and secured with a crown. He wears a brown inner robe and a turquoise outer robe with biscuit-fired medallions showing the three peaked mountains of the Immortals on his shoulders and above the knees. The face and hands are also biscuit-fired. One of the most popular items in the Chinese Collection, this Ming Dynasty (dated 1486) polychrome stoneware figure of Budai Hesheng from Henan Province is in the 3-color palette of the Tang Dynasty. The “Laughing Buddha” is depicted as a fat, smiling bald man dressed in the loose amber robes of a mendicant monk, and holds a green-glazed cloth bag in his right hand. 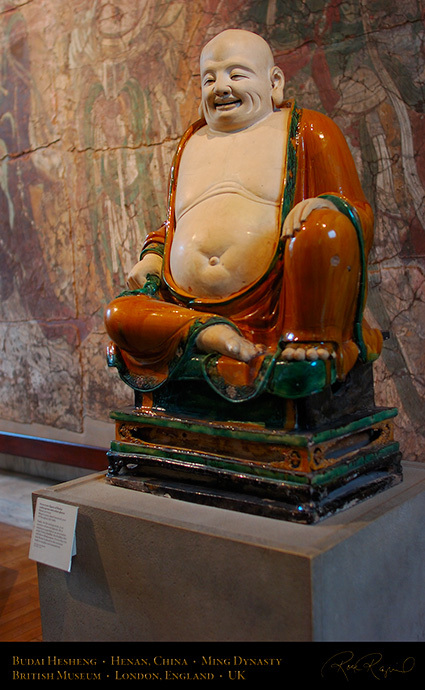 Budai is considered to be both an incarnation of Maitreya (Buddha of the Future) and as a Luohan (see below). 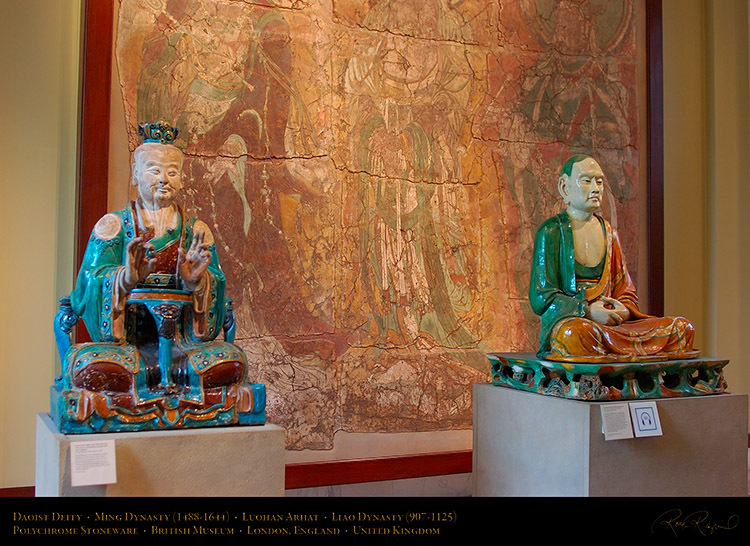 On the left, the seated Daoist deity who is holding a black pearl in his right hand. (Highest Artisan Old Grandfather). Polychrome enamel with biscuit-fired areas. Liao dynasty (907-1125), found in the Yizhou caves west of Yi Xian, China in the early 20th c.
This was one of seven found together, part of a celebrated group of 16-18 found in the caves. It is glazed in the 3-color palette of the Tang dynasty and exhibits somber dignity and power. that all humanity might aspire to the spiritual understanding attained by the Luohan. 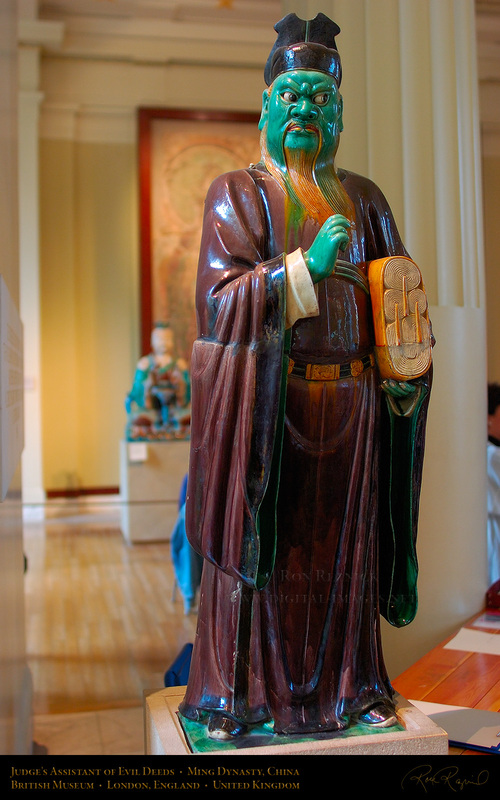 15th c. Ming Dynasty polychrome enameled glazed stoneware sculpture of an Assistant to the Judges of Hell, dressed in the robes of a scholar-mandarin, carrying scrolls which describe Evil Deeds of the defendant. Made in Shanxi Province, China. 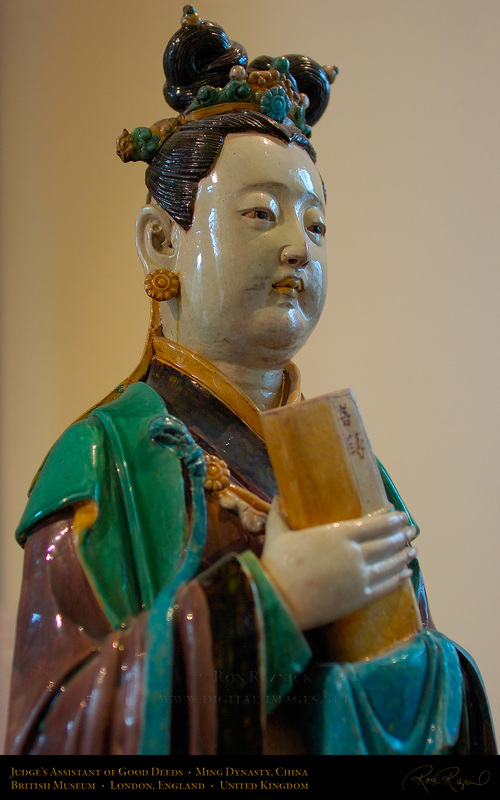 15th c. Ming Dynasty polychrome enameled glazed stoneware sculpture of an Assistant to the Judges of Hell, in the form of a standing woman holding a slender volume labeled ‘Shan Bu’, or “Good Register”. Made in Shanxi Province, China. One of a pair of ‘Hsun ok’ (offering vessels) made in Mandalay, Burma in the 1880s. and bears a ‘Hintha’ or Hamsa bird (an aquatic bird, possibly a bar-headed goose). is a royal bird associated with Brahman, the Supreme Spirit in Hinduism. including the single surviving tray is decorated with a brilliant red lacquer finish. Made of bamboo, lacquer, colored glass, gold leaf, gilded metal sheet and wood. The intricacy and depth of the design reveals the sure hand of a practiced artist. 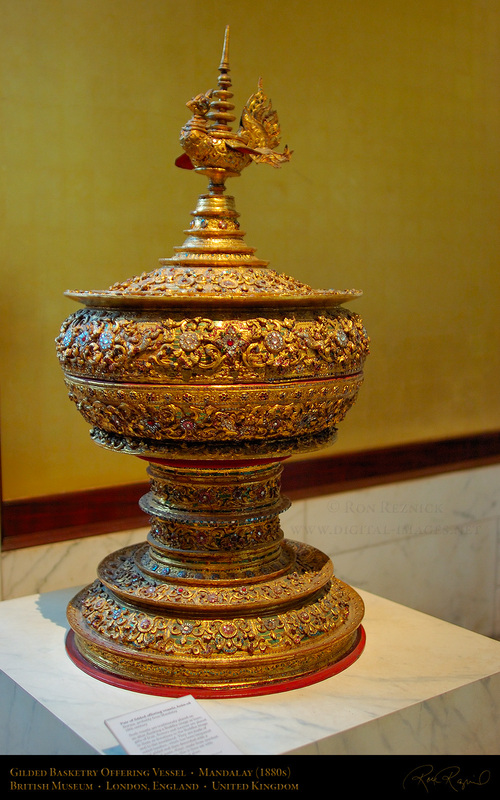 The use of gilding all over the surface indicates that it was made for royal use. 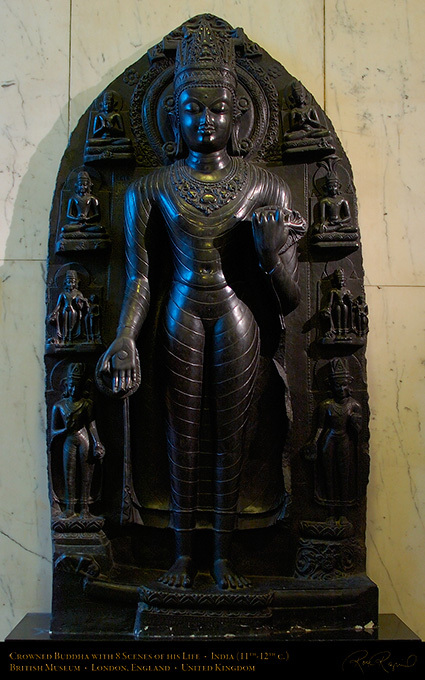 A large standing figure of the crowned Buddha as a Universal Sovereign, his right hand displaying the Varada mudra. He is surrounded by eight scenes of his life, carved in blackened gray schist in the 11th-12th century. The Crowned Buddha was found in a cemetery in Bodh Gaya, Mitra, India, the location of the Buddha’s Enlightenment, in 1878. Tara, the Bodhisattva of Compassion and both the consort of and the female aspect of Avalokitesvara, also Bodhisattva of Compassion. 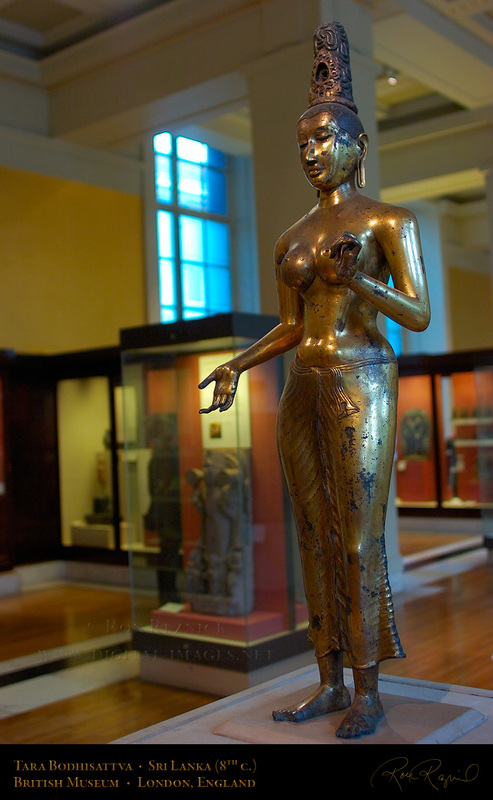 From the 8th c. (700-750) Anuradhapura culture of Sri Lanka, it was solid cast of bronze using the lost wax method and gilded. The eyes were probably set with precious stones, as were the flame-like settings in the medallion. 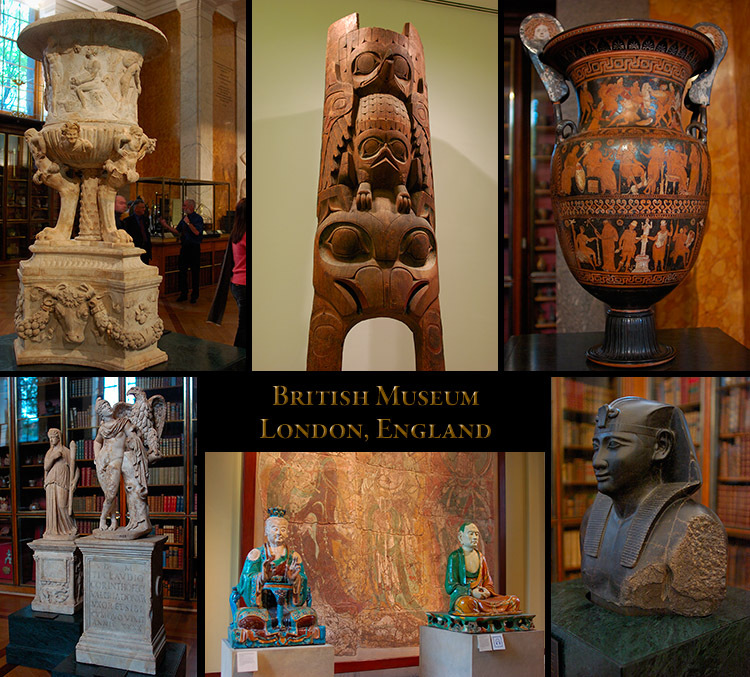 Click the Display Composite above to visit the British Museum page.